Version 1.25 was released on Nov 11, 2013. 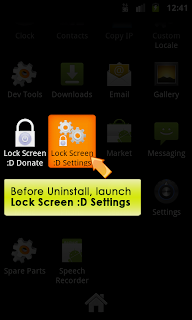 It improves the lock experience for device running Android 4.2 and auto-kill itself a bit faster. Please feel free to send me email if you have any questions / comments on my apps! Version 1.24 was released on Jan 6, 2013. A new "Force Lock" option is added. 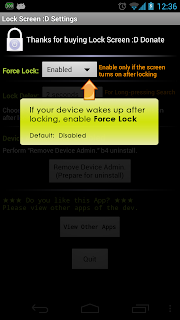 Enable this option if your device wakes up due to bugs in some vendor's system . 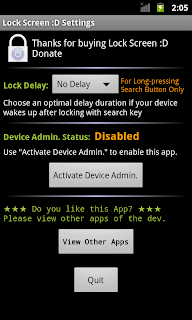 It also further improves the lock experience for device running Android 4.1 & 4.2. Version 1.23 was released on Dec 24, 2012. Version 1.22 was released on July 23, 2012. Version 1.21 was released on April 12, 2012. I have to play some tricks there to make it work because Google changed the 'lock' function without letting the developer know. Version 1.2 was released on April 3, 2011. - The delay can be changed in settings app. 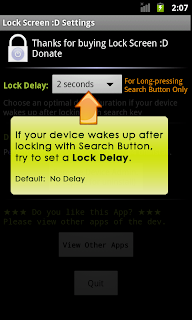 *This option is useful for users whose device wakes up after locking by long-pressing Search Button (due to some OS issues). Version 1.1 was released on Feb 8, 2011.